Liberians Vote For Next President, As Ellen Johnson Sirleaf Steps Down : The Two-Way Voters are choosing between soccer star George Weah and Vice President Joseph Boakai. This will be the first time in 70 years that power is transferred between democratically elected Liberian leaders. A woman casts her ballot at a polling station in Monrovia, Liberia, as Liberians go to the polls for the second round of presidential elections on Tuesday. In Liberia, voters are heading to the polls to decide on their next president, choosing between an international soccer star or the nation's long-time vice president. President Ellen Johnson Sirleaf, a Nobel Peace Prize winner and the first female head of state elected in Africa, is stepping down at 79, after two terms in office. 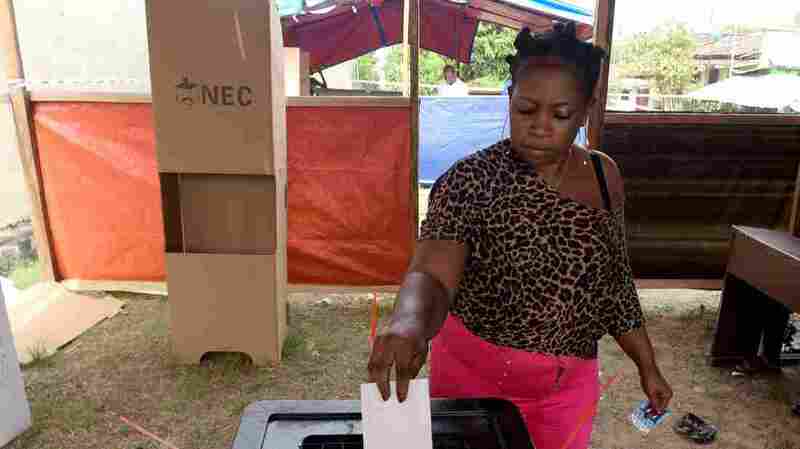 The runoff election to determine her replacement is noteworthy — this will be the first time in 70 years that one democratically elected Liberian government passes power to another legitimately elected government. "The choice is between [Sirleaf's] 73-year-old vice-president Joseph Boakai and senator and former soccer star George Weah, who's 51 and popular with Liberia's youth," NPR's Ofeibea Quist-Arcton reports. "After a good turnout during October's first round, the runoff scheduled for Nov 7 was delayed by a court challenge citing alleged rigging and irregularities," Ofeibea says. "The National Elections Commission has said voter lists have been cleaned up according to Supreme Court orders. They have been posted at all 5,390 voting places. "Both candidates said they were pleased with the turnout as of midday. "Weah also spoke after casting his vote.
" 'This is a good process, and a very peaceful one, which is the most important,' he said. 'We subscribe to a peaceful and free and fair election, so we know the process will be transparent. It's what we hope for.' "
In 2005, when Weah lost against Sirleaf in the presidential campaign, he challenged the election results as rigged. International observers said that election, which Sirleaf won with a substantial lead, was "largely free and fair," as NPR's Ofeibea Quist-Arcton put it. When she took power in 2006, she was responsible for an impoverished nation that had been riven by civil war. "We inherited a devastated country after what you might call two decades of economic freefall, [and] 14 years of civil conflict that resulted in the death of a quarter of a million people, with one million additional people displaced — many of whom resided in refugee camps in neighboring countries and other countries abroad," Sirleaf told Fresh Air in 2009. "Infrastructure ruined, all institutions dysfunctional — civil servants, army hadn't been paid for years — foreign missions, in fact, under sanctions by the U.N. for the misuse of resources to fuel the war. A people with hopelessness, a people destitute, a people impoverished." Sirleaf managed to get Liberia's tremendous debts forgiven, which was a remarkable achievement, as as journalist Helene Cooper explained to NPR earlier this year. But her government has been criticized for ongoing corruption and nepotism, including the jobs that she gave her sons. She defended her record to NPR in 2015. "Which government is flawless? Do they know where we started in 2006?" she said. " Yes, we do have corruption in the country. It's been there a long time." Foreign Policy, examining Sirleaf's legacy this October, noted that she's beloved abroad but unpopular at home in Liberia, where "most people are mired in poverty, the health care and education systems are in shambles, and roads and electrical grids are only starting to be rebuilt." "Sirleaf delivered modest, incremental gains when what her supporters expected was a dramatic reversal of their fortunes overnight," Prue Clarke and Mae Azango write. Sirleaf has, more recently, had to grapple with her nation's devastating Ebola crisis, which killed thousands of people. Of the affected West African nations, Liberia was the quickest to contain the outbreak (although the virus then reappeared several times.). And Sirleaf told NPR in 2015 that a sort of resurgence came along with the suffering. "We were the poster child of everything that could go wrong: disaster, death, destruction all over the place," Sirleaf sad. "We too, as a result of Ebola, had a re-energizing of ourselves. We saw a new opportunity to turn this crisis into something that will be good for the country."